Picking a family-sized SUV might seem like a daunting task, but when you have choices like the 2016 Hyundai Santa Fe lined up for you, it will be easier to make a decision than you think. When you’re ready to choose a new car to tote your crew around in, check out the wide selection of stunning Hyundai vehicles at Butler Hyundai in Medford, serving Klamath Falls, Grants Pass, Ashland, OR, and the greater Medford Metra Area. Let’s see how the 2016 Hyundai Santa Fe stacks up against the likes of the Nissan Rogue. If you're looking for an SUV with lots of storage space and decent power with great gas mileage, you're probably considering between the Hyundai Santa Fe or the Nissan Rogue. The Santa Fe comes equipped with Seven Airbags, Blind Spot Detection, Lane Change Assist, Hill-start Assist Control and an Anti-lock Braking System. The Nissan Rogue comes equipped with Advanced Air Bag system with dual-stage supplemental front air bags, driver and front passenger seat-mounted side airbags, roof-mounted curtain supplemental air bags, Vehicle Dynamic Control with Traction system. Forward Collision Warning, Blind Spot Warning, Lane Departure Warning, Moving Object Detection, and Tire Pressure warning. Hyundai has not been a powerhouse among cars but has recently stepped up their game in the car industry. It is safe to bet on Hyundai that The Santa Fe has more safety features as Hyundai pride themselves in reinventing their name. It's all about driver and passenger comfort when it comes to these cars. In the Santa Fe, the head space is 39 Inches, and the Leg space is 41 Inches. In the Nissan Rogue, the headspace is 41 inches, and the leg room is 43 inches. When it comes to the driver space, the Nissan Rogue has slightly more space. The 2016 Hyundai Santa Fe is 290 HP with a V6 engine that gets an estimated 20 MPG. Featured included seven airbags, extra storage space and legroom space, Stain-resistant cloth seating, XM radio, BlueLink, Bluetooth, and 10-year/100,000 Mile Warranty. 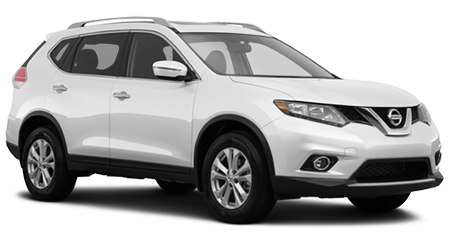 The Nissan Rogue comes with a 170 HP Engine that has an estimated 33 HWY MGP. It has five seats, four doors. Features include an 18" Aluminum-alloy wheels, NissanConnect with Navigation, Around View Monitor, and Leather-appointed Seats. If you're looking for an SUV with lots of passenger and storage space the 2016 Hyundai Santa Fe is the answer. Packed with power, this ride will get the job done and have you smiling all the way. Butler Hyundai serves the greater Medford Metro Area including Ashland, Grants Pass, and Klamath Falls, OR with a huge inventory of great Hyundai cars and SUVs like the Santa Fe. Come and see us today!